Becoming a genealogist makes you brave. In my quest to find one more connection I have made leaps, cold calls and “email friends” with a variety of individuals that I never would have before. 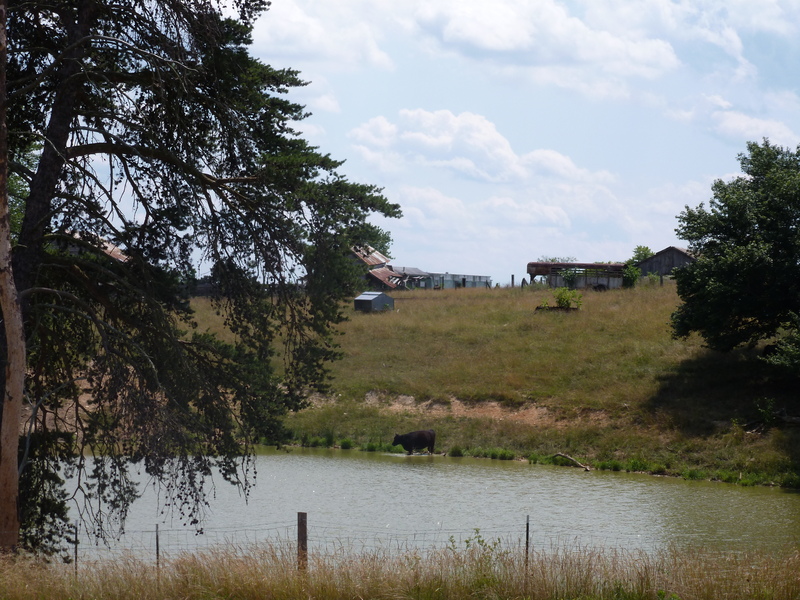 One of the leaps I made was regarding a piece of land in Campbell County, Virginia. I was using Google to search a variety of things when I discovered a tract of land for sale. 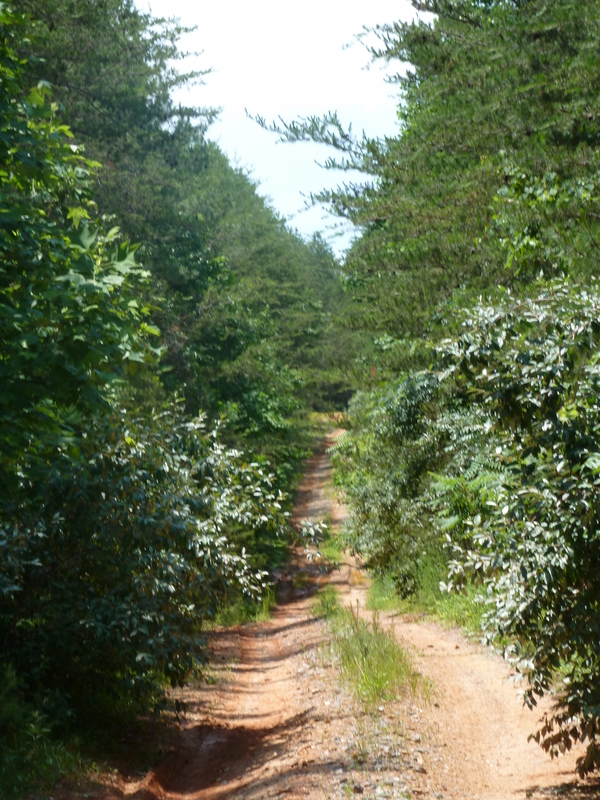 It was called the Sublett Tract. I was curious about this property, so I made an inquiry. When Gary replied, I think he thought he might have a buyer on the hook. I explained my situation via email about my genealogy quest. Gary not only provided me with the information about the property, he agreed to let me visit the property on an upcoming genealogy trip. He arranged for the gate to be open. In order to set the scene, you need to know we were in my mother’s new Toyota Highlander and we were going off-road. The second car in our two-car convoy aborted the mission. 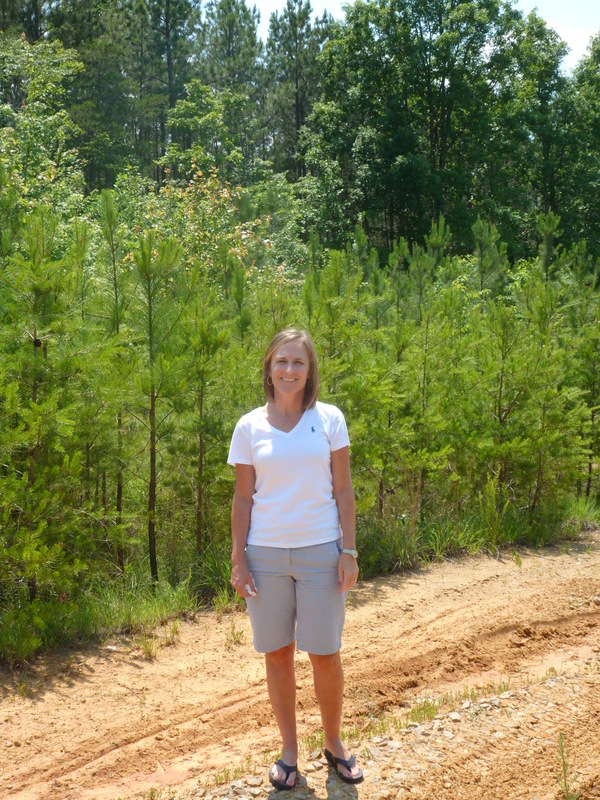 Mom, being brave, took to the pasture road that we thought the tract was on. It turned out it wasn’t it. We had to come back to the main road and try again. Mom was a trooper that day. 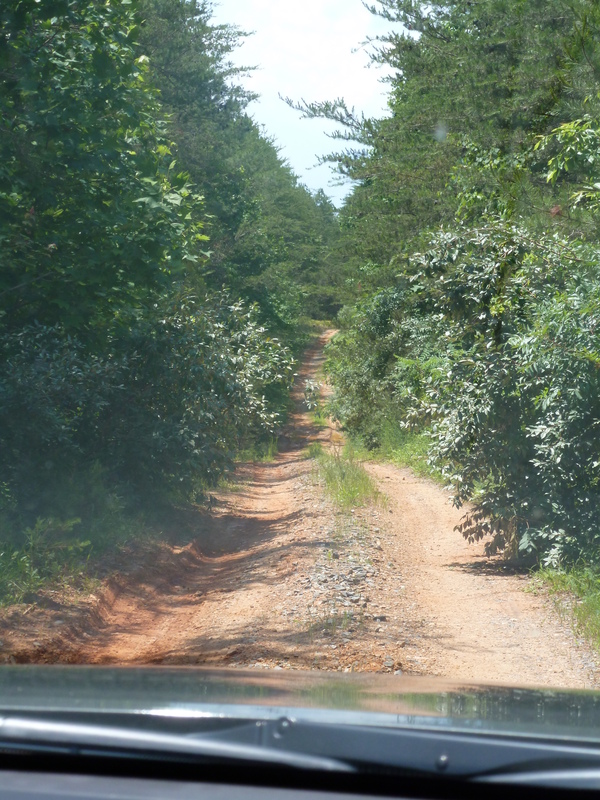 When we finally found it, the road in was a dirt road, mud all around with that red, red, Virginia dirt. Mom took us down this path a bit, but we soon realized that we might not get the car back out. So, she dropped us off, and she went to find the rest of our convoy. Kathy and I walked down this muddy dirt road, it was probably a quarter of a mile, but since we were trying to avoid the mud, we had to walk around the puddles. Oh, yes, I forgot, I had told everyone about wearing good shoes for our adventures, but nobody listened. So, if I recall, Kathy was in sandals. We made it to a clearing. There were no structures, as this piece of land was farmed and not the actual homestead. It was beautiful though. I was so glad that we did it. To research an area where generations of my relatives farmed, to find it quite by happenstance online, and then to stand on that same property was rewarding. Mom’s car was DIRTY. You know the kind of dirt that gets onto the under carriage and then sputters off clumps from time to time. I bet you, I could probably still find some of that Virginia clay on her car if I looked. So, getting back to my conversation with Gary. I asked him what he knew about the property. They are selling it as a rural retreat with lots of pine trees. There is good hunting on the property and good fishing nearby. When I asked him about the land, he wrote that the following. Tobacco. Bright tobacco, flue-cured tobacco, maybe some burley tobacco–that was the crop that drew people to this area when this section of the state was settled in the early 1700s. That was the big money crop that kept agriculture strong around here for the next 200 years–or up until about 1980, when the federal tobacco buyouts started & the federal subsidy programs were phased out. The red clay soil down in that part of the county would have produced pretty nice tobacco, I would expect. Everyone grew tobacco–small farmers & large–factory workers, even government workers that owned small acreages. The federal tobacco allotments ran with the land and could be rented for cash to other growers. Back in the 1950s & 60s, small tobacco growers would net about $1,000/acre with their tobacco. It was hard work & had some risks, but that was always true of farming. You may want to check with the Campbell County–the old ASCS office–Agriculture Stabilization & Conservation Service–it goes by a different name today…maybe Agriculture Resources Service or something similar. County seat is Rustburg, VA. ASCS administered all the government ag programs–so there maybe a record of your grandpa’s farm. Besides tobacco, the Sublett farm would probably have produced corn & wheat, oats for the horses or mules–if they couldn’t afford a tractor–& many couldn’t before the war. There were a lot of grist mills along Falling River–so the basic grains would have been important. Beef cattle were not very important back then, but just about everyone had a milk cow or two, maybe more–and they needed hay for the cows & horses, esp. lespedeza hay for the horses. Everyone had chickens for eggs & meat–as well as hogs. Some people raised turkeys, too. They probably sold their tobacco in the Town of Brookneal–that was not far away & a big tobacco market about 100 years ago. Also may have sold eggs, cream & butter in Brookneal or the nearby cross-road hamlet called Hat Creek. Cow’s cream was also an important cash crop and mill trucks form Cloverleaf & other big-name dairies would make the morning pick-up in milk-cream cans at the road side entrance to farms. The cream was skimmed from the top of chilled milk and was worth much more than the milk itself. There was rail service in Brookneal–Norfolk & Western, as well as a little further north, at the little hamlet of Naruna. Rail was the key freight link back then–in the 1950s, I can remember going with my Daddy to the rail depot to pick-up a new black & tan coonhound puppy shipped from Kentucky–as well as a big box of baby chicks–New Hampshire Reds, that may have come from Sears & Roebuck in Greensboro, NC. Your grandpa’s neighbor to the south would have been the Presbyterian church property that was known as Camp Hat Creek for many years. It was recently put up for sale by the Presbytery–not sure of its current status. Attached is a copy of the farm plat of 85.5 acres, dated June 18, 1920–recorded in Plat Book 2, Page 10 in the Clerk’s Office of Campbell County. “Plat of land containing 85.5 acres sold by Mrs. Louise W. Rosser to Charles S. Stevens on Little Falling River…” Sorry about the plat quality–must close; probably more info than you needed. But hope that helps a little. Okay, I do not know about you, but WOW, what a generous man. He doesn’t know me and he took the time to write all of that information. Needless to say, you “meet” a lot of wonderful, big-hearted people doing genealogy. I sent him a thank you of course along with the below photo. Thanks again Gary! 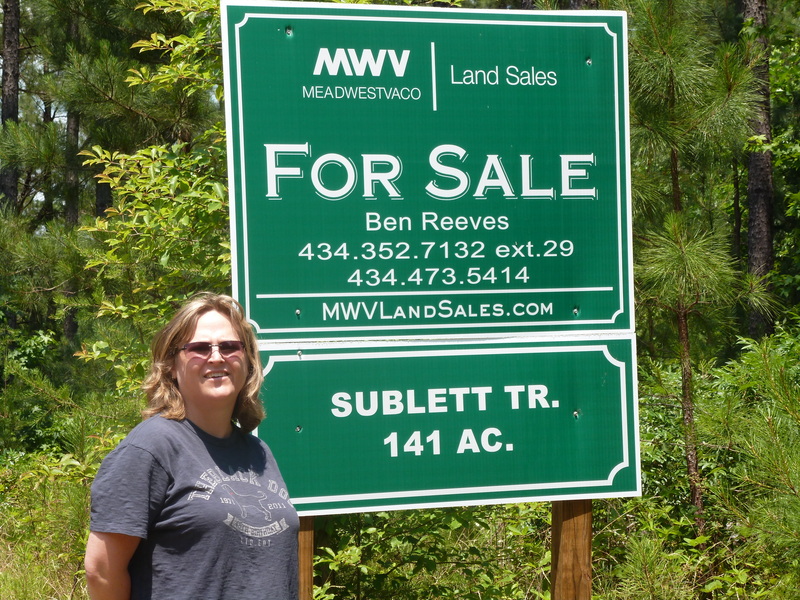 Krista in front of Sublett Tract sign. This is why I do what I do. Until next time, I will be exploring backwards. One of my treasured pieces of genealogy is a file called “250 years with 6 generations of Whitehead’s,” that Mae compiled. It is in her cursive, and a true treasure. According to her sister, Mary Elizabeth “Betty”, it was her little green book. I do not have the original but it is the information that she gathered that helped me develop the Whitehead side of my tree. Martha Mae was my 1st cousin 1x removed. Her parents were Walter Joe and Emma Chloe Adams. See it is important to know that Emma Chloe Adams, was the wife of my grand Uncle (i.e. my dad’s uncle). She compiled the 500 page genealogy of the Adam’s family. She however passed before it was published, her daughters Martha Mae and Mary Elizabeth “Betty” fulfilled her contract. So, as you can see genealogy was in her blood as well. Martha Mae “Mae” was born 11 October 1925 at home in Carlton, Madison County, Georgia. She was named after her Aunt Martha Ann Whitehead. Mae passed away last November at the age of 87 years old. The beauty of her life is that her mother, Chloe, preserved some of it in this book. Chloe wrote, “Mae had a sweet little round face and long black hair which Joe thought was beautiful. When Joe came in for lunch or at night, he stood by her bed to watch Mae in wonder for a long periods of time until she grew old enough for him to play with her on the big bed” (Whitehead, 1983, p. 296). Mae graduated from Elberton High School in spring of 1942. World War II was in progress. She graduated from Georgia State College for Women with a degree in Home Economics. She married Henry Brock Snelling Jr., on 2 August 1949. Mae went on to have a great career in education and counseling. According to her obituary, Mae was survived by her son Charles and his wife, her son Joe, two grandsons and three great-grandchildren. Her obituary is attached. Click on the below link. 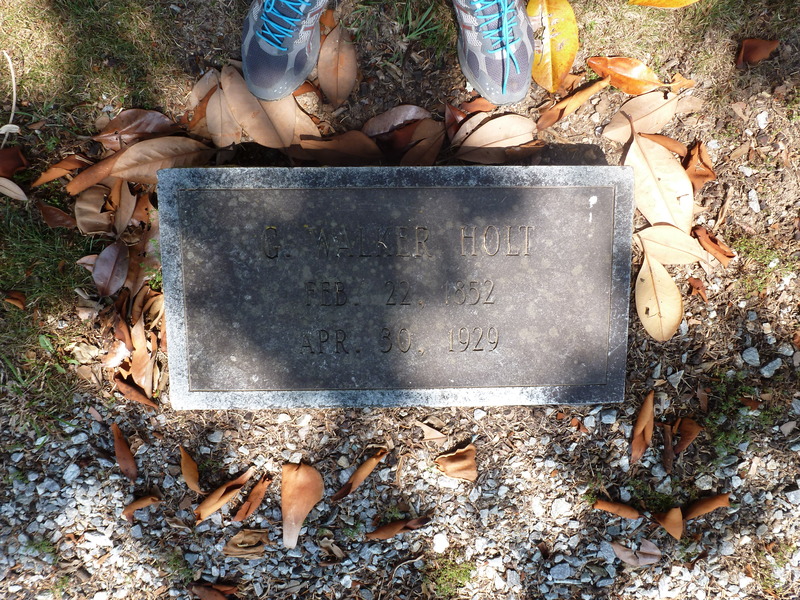 Guilford “Walker” Holt, my 2nd great-grandfather was born 22 February 1852 in Campbell County to Thomas and Elvira Holt. He was the 5th child born to Thomas & Elvira. They had a total of 8 children. I do not know much more information than what I found in the Census records. Walker is listed as only 7 years old in the 1860 census. Their post office is listed as Brookneal, Eastern Campbell County. Thomas, Walker’s father, is listed as an overseer of a farm and has an estimated combined real estate & personal property estate $1532. In the 1870 census, Walker is living and working at home. His father’s estate is now valued at $2852. However, their post office is now listed as Lynchburg, which is about 30 miles away from Brookneal. The 1880 census, lists Walker still living and working at home on the farm. No financial information is asked in this census. 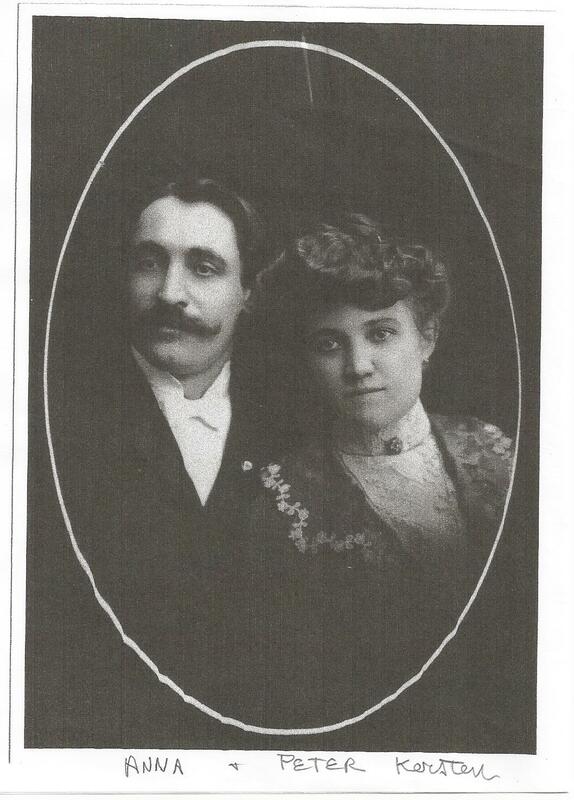 Walker marries Sue Etta Wood in 1881, he was 29 years old, she was 20 years old. The 1890 Census was destroyed by a fire at the Commerce Building in Washington, D.C. The 1900 Census shows Walker as head of Household, it also gives us the first look at his family. It indicates he was married in 1881 to Sue. He is still listed as a farmer. Living with him are his children, Georgia (my great-grandmother), Archie, Valie, Chas and Eivel. 1910-Virginia 1910 Census Miracode Index lists the Walker as head of household, living with his wife, Sue. Also at home is Archer, age 23, Charlie, 16, Ewell, 13, Manley, 6. His daughter Georgia is not longer listed at the residence (we will discuss her at a later date). 1920-Wallker is 67 years old; He owns his own farm. He is now living with his wife, his son Manley Thomas and has a step-daughter by the name of Lena Martin who was born 1915. Walker dies on 30 April 1929. He was 77 years old. Last year when I went on my Virginia genealogy adventure, we went to the Falling River Baptist Church in Brookneal where he was buried. It was a beautiful cemetery. I remember it was a very sunny day. Several of the tombstone photos I took didn’t turn out as good as I had hoped because there were shadows from the big trees. There were a lot of other headstones with the name HOLT. I took pictures of them in advance, knowing that I was probably related somehow. Here is a picture of a cow going for a swim in the tank. I can’t help to think about his life during that time period. He was about 11 years old at the start of the Civil War. He would have been about 13 when President Abraham Lincoln was assassinated. So he would have lived through Reconstruction. If my teachers would have told me that my second great-grandfather lived through reconstruction, do you think I would have listened more closely? Nah, I don’t think so either. But now, just to imagine them there, I can visualize him and his family. What kind of farmer was he? Did he grow tobacco like so many farmers did back then? These are some of the questions I ask as I explore backwards. I know the picture is terrible. But that is all I have. Until next time, I will be exploring backwards! I have had less success researching my mother’s maternal grandfather’s family. Thomas Irving Moss (my great-grandfather) was born in 1877. I have said before that his father was Thomas Moss (my second great-grandfather). His wife was Margaret O’Brien. We know this because of Thomas Irving Moss and Carrie Lou Hick’s marriage certificate. But who was Margaret O’Brien. I found Margaret and her family in the 1860 Census. She is the daughter of William O’Brien and Sarah “Sally” Loyd. William O’Brien was Ireland. But she is not living with the family in 1870. She could have been living with another family as a domestic servant, she could have been married by then, and not living in Buckingham (as I cannot find Thomas Moss in 1870 either). But that is really all I have right now. I know more about her brother’s because they become heads of households on census records. Virginia did not begin keeping marriage records until 1912. So, I cannot find the answer there. I will have to scour other sources to build upon what I know about Margaret. Also, I have run into problems with the last name. Some documents have her listed as O’Brien, O’Brian, and O’Bryant. I do not even know where she was buried. So you can see it is often frustrating to explore backwards. Patience and creativity will prevail. I will have to let you know when. Cynthia Lu Stevens was my great-grand aunt. She was born 25 Feb 1877 and died 10 Jun 1964, at the age of 87 years old. She never married. I asked my first cousin 1x removed, Betty Whitehead Sweeny, via email to recall her memories of Aunt Cynnie. She stated “Aunt Cynnie and Pelly never married. They lived in the house in Sandy Cross together with Uncle Joe (Joe Augustus Stevens Sr), his wife, Aunt Rita (Rita Durden) and their only child, Joe Jr. (Joe Augustus Stevens, Jr)…The house was built either by great grandpa Augustus (Columbus Augustus “Gus” Stevens) or his father (Obediah Benjamin Stevens). It was located on a huge farm and some income came from the land….Aunt Cynnie did the shopping and drove a Chevy Coup.” Aunt Betty goes on to say that both Aunt Cynnie and Pelly attended “Finishing School” in Athens. Cynnie attended Brenau University located in Gainesville, Georgia. Cynnie died in 1964, she is buried in the Stevens Family plot at Sandy Cross Cemetery, Oglethorpe County, Georgia. I wish I could have known more about Cynnie and her sister. Why did they not marry? Why did they not live outside of the family home?